The Glorieta Mountain Meteorite is an exceptionally attractive meteorite. It is found in two forms, siderites (irons) and pallasites (olivine and iron). The ratio of iron to olivine in the pallasitic forms favors iron with usual compositions of 60% iron to 30% olivine. But sometimes Glorieta irons are found with only one or two olivine crystals showing. So the distribution of olivine in the metal matrix is spotty. A spectacular Glorieta iron meteorite of 1,592 grams in weight with blue black fusion crust and several olivine crystals in the midst of the numerous thumbprints. 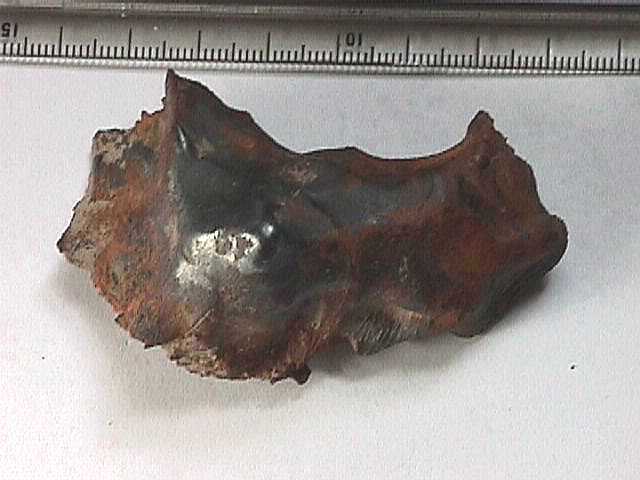 Though this meteorite has been on the ground for many hundreds of years it looks like it fell "yesterday." A fine 190 gram example, this one has flow lines in the blue black fusion crust on the bottom edge. Often fresh fallen meteorites will have flow lines caused by the thin coating of melted rock or iron streaming all over the specimen. But fractions of a millimeter beneath this crust. the underlying matrix remains unscathed by heat. 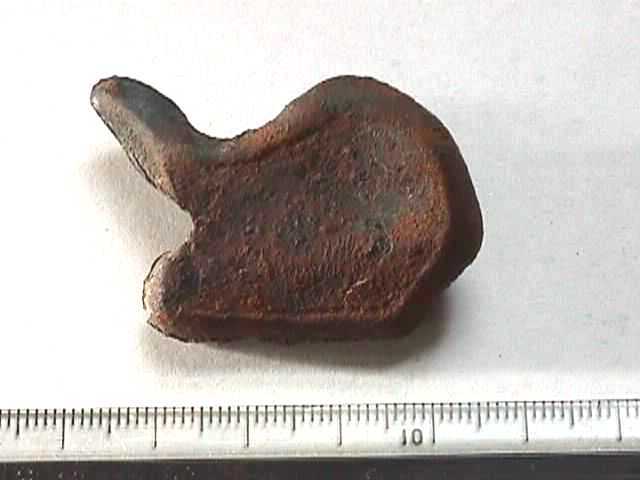 A very unusual oriented Glorieta iron of 51 grams weight, the view is from the back and clearly shows the melt build up along the outer edge of this otherwise flat specimen. On the other side, the nose, very fine flow lines radiate from the apex, which was originally a single olivine crystal blown, or burned out in flight. 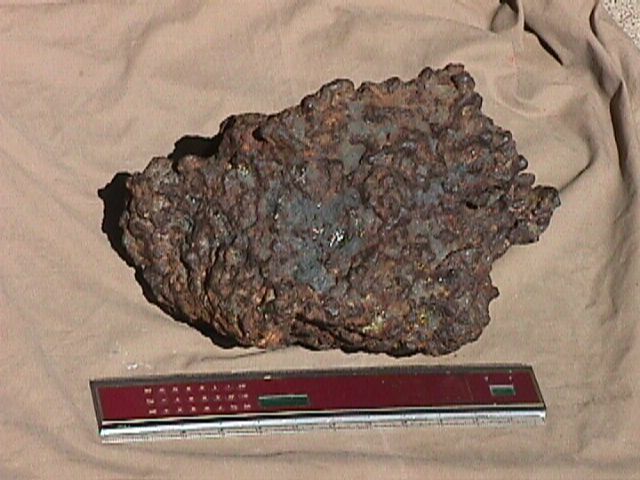 A large 20.4 kilo pallasite found in the Glorieta area. 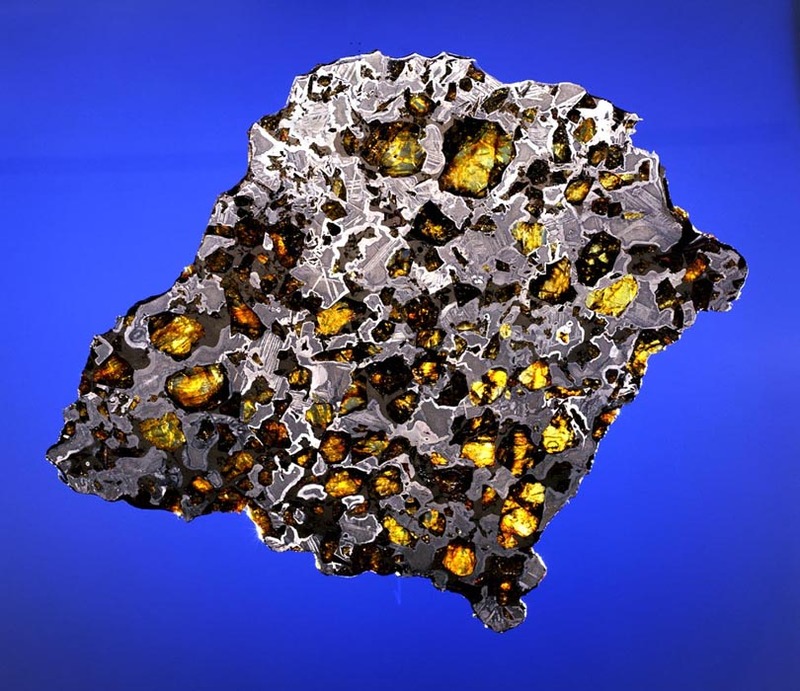 The deep recesses of this otherwise iron meteorite are chock full of olivine crystals, which appear as glassy yellow green crystals. Also present are patches of slate gray fusion crust, a clear indication that this meteorite must not have fallen too long ago. 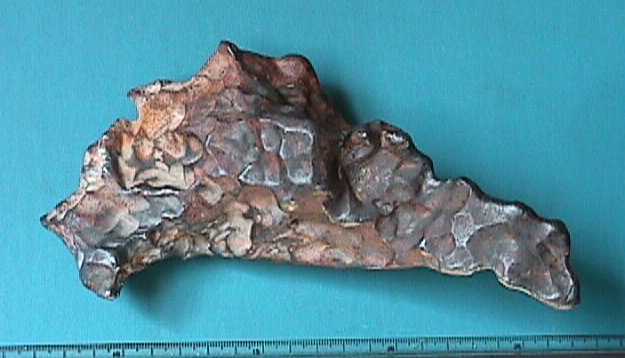 NOTICE: A 444.5 gram full slice of Glorieta meteorite very similar to the one shown, one of six such full slices, was stolen at the 2001 Tucson Gem and Mineral Show. The piece is very thin so as to see through the crystals, and measures about 8" x 7". The case lead, #0102088018 is with Officer Pike, of the Tucson Police. Any information that might be gleaned with regards to this case should be provided to him. There are leads as to the one(s) responsible for this theft, and it would be greatly appreciated if information is provided should this specimen be seen. Also, should the piece be returned, no questions will be asked, and no prosecution will be warranted.